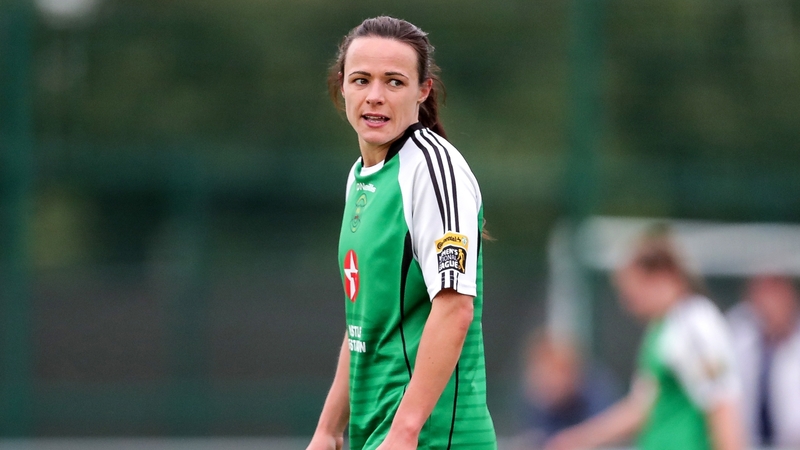 Peamount United's Amber Barrett speaks to Sinead Farrell ahead of her debut appearance at the Aviva Stadium for the FAI Cup final. Amber Barrett reckons the Aviva Stadium surface will suit her when she lines out for Peamount United today. The bigger goals and wider space is a solid ground for any goal-poacher to play in, and this is especially true for Barrett after she retained the Women's National League golden boot award this year. As she looks out onto the grass of the Lansdowne pitch on the Wednesday before her side's FAI Cup final against Wexford Youths, she recalls a time when she didn't think this opportunity would ever come her way. "I'm just thinking about a couple of years when I was in watching a men's game and it was light years away to think that someday I'd be playing here in a cup final for Peamount United. "It's surreal really to be honest but I'll take it in." Reaching this personal milestone at the Aviva Stadium is a fitting way to end her campaign following a season of firsts for the Donegal native. 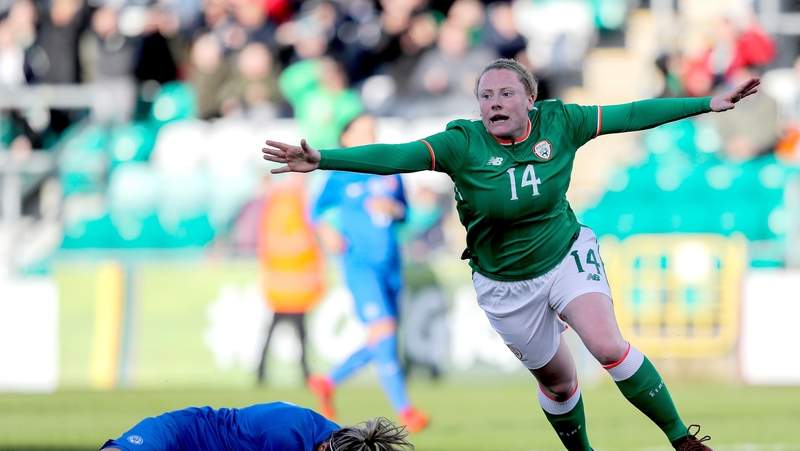 She made her senior international bow against the Netherlands in a World Cup qualifier last November, and scored her first goal against Slovakia earlier this year, hitting the winner for Colin Bell's side in Tallaght Stadium after coming on as a sub. More recently, Barrett also netted the decisive goal against Shelbourne that propelled Peamount into the FAI Cup decider against a Wexford Youths outfit, who are chasing their second Cup title in four years. Her stock is rising all the time in soccer, which isn't all that surprising given her county of origin. Donegal has developed a unique tradition of producing Republic of Ireland stars and Barrett is getting closer to taking a place in that group. It all begs the question - what are they serving in the water in the that neck of the woods? "I actually think we have a wee bit of a bite about us," Barrett explains. "I think when you come up to Dublin there's a few fairies running about," she says jokingly. "I was playing Gaelic games when people would come in and just take you out of it. That was just the way it was and the way it still is. If you go up and watch a Sunday league team [there's] tackles going in left, right and centre. I just think it's the little bit of bite that we have. "We're nearly a forgotten county in so many aspects but I think when we get a stage to perform we rarely let ourselves down." For years, Barrett was a dual star across the Gaelic football and soccer codes but has made the decision to focus her energies exclusively on soccer. There was never any pressure placed on her to make a choice between the two, but the desire to represent her country eventually crept to the surface and trumped her commitments to Donegal football. She still supports her old team-mates and was disappointed for them when they lost out to Cork in the All-Ireland semi-final earlier this year. Had they won that game and contested the All-Ireland decider against Dublin, Barrett would surely have felt a a slight pinch and a longing to be togging out with them in Croke Park. But all in all, things have turned out pretty well for the 22-year-old. "I'm their biggest supporter, I always will be and I always want them to do well. I played it for most of my life so I can't just forget about it as well. I owe a lot to them for that little bit that's inside me. "When I was young it was all about playing in Croke Park. My brothers played in Croke Park and my dad managed a team in Croke Park. I was probably the one people thought would get to Croke Park first but didn't. I'm grateful for what I have as well and you can't have everything. 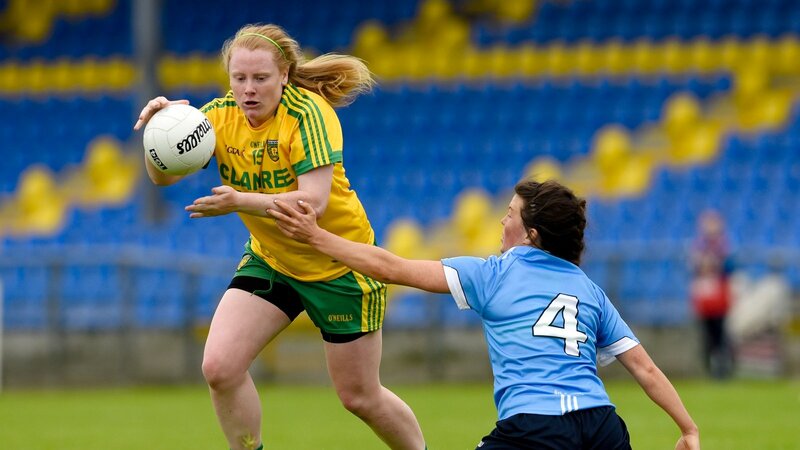 "They've [Donegal Ladies] won two Ulster titles since I've left and I would have loved to have experienced that as well. But I can't take away from the fact that I've played in the World Cup qualifiers, playing against the European champions the Netherlands, scoring my first international goal. I'm grateful for what I have as well and you can't have everything." Barrett has made considerable progress in the last year, which is reflected in her winning a second consecutive golden boot award. Her score tally has almost doubled across the two seasons, going from 16 goals to 30. She puts her improvement down to a few factors; Bell's influence on her training, completing a pre-season programme with Peamount United as well as her natural maturity as a footballer. She also has Áine O'Gorman alongside her in attack, who recently retired from international football with 100 caps to her name. 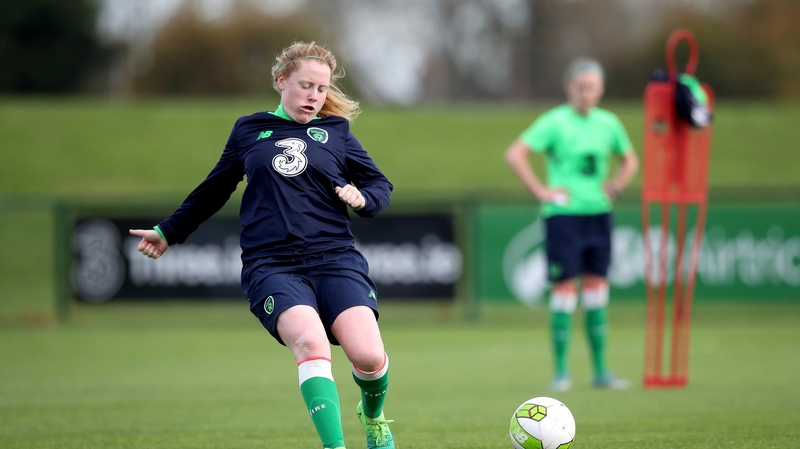 O'Gorman returned to Peamount last year having previously spent some time with UCD Waves, and Barrett says that she has brought a different edge to their training. "I can't commend her workrate and attitude [enough]. For somebody who has 100 caps and she's still only 30 years of age. People talk about her like she's an old player and yes she's more experienced but the woman has years left in her because of how well she looks after herself. "Her attitude in how she looks after herself is just spot on and everything, her workrate and her desire to win is just huge. I think that was maybe something we were missing at Peamount, you don't want to be on the losing side. "We've had more fights at training than we've ever had. It's good to have that little bit of bite at each other as well. I think that's what the likes of Karen [Duggan] and Áine have brought into the squad. It's huge for us and I think that's why we are in the position we are." Barrett's immediate focus is naturally with Peamount this weekend, and their quest to win a first FAI Cup crown since 2010. But looking beyond that, she knows that she will have to aspire to play club football outside of Ireland if she wants to further her intentional career and improve on the start she has made. Speaking to Marie Crowe earlier this year, she mentioned her love for Manchester United who had plans in motion to re-establish a women's club at the time. That team has since arrived and their manager Casey Stoney was in Dublin recently for the launch of the 20x20 initiative to promote women's sport, where she revealed that the Old Trafford side took their time with this project because 'they don't do anything by half measures'. Those opportunities will hopefully come in time for Barrett. But for now, her main concerns revolve around completing her Masters in Education in DCU and adjusting to the grass in the Aviva Stadium where Peamount are aiming to end an eight-year wait for the FAI Cup. "Of course that's the dream when you're playing in the back garden - you were Ruud van Nistelrooy or Dwight Yorke and you just had that ambition of playing. The fact that it is a reality now and you could ask 100 girls who they would want to play for now and most of them would probably say Man United. "Any player that's playing at a high level and players playing with the national team has to have ambitions of going abroad. You'd be mad if you didn't, but at the same time I'm very happy where I am, I'm extremely happy doing my college [course] and finishing off that and seeing where that takes me." Follow both FAI Cup finals this Sunday via our live blog on RTÉ.ie/sport and the News Now app, or watch exclusive live coverage on RTÉ2 and worldwide on the RTÉ Player from 11.45am. Live national radio commentary of Cork City v Dundalk on RTÉ Radio 1's Sunday Sport.